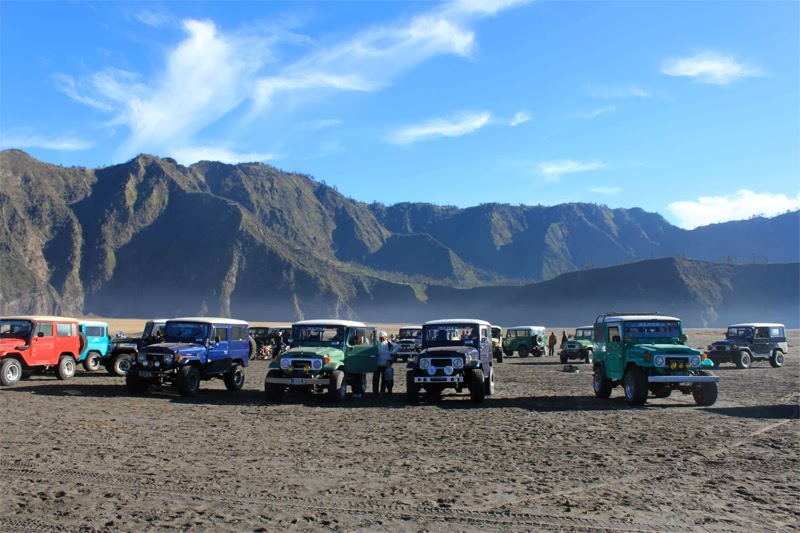 Mount Bromo Jeep Rental or Hardtop Rental is the most recommended way to enjoy the sunrise from the highest peak usually called viewpoint (Pananjakan). Rental Jeep on Bromo mountain very suggested for all visitors because the route condition is very steep and many blind turning along the way. If You are interested to enjoy Bromo Sunrise tour package, Our tour agent "Bromo Java Travel Agent" provided the Jeep Rental Package, Our partner will serve your booking along 24 hours, You only inform Us the participant amount You have then the picking up location. We provided the Jeep or Hardtop rent not only for Mount Bromo tour package but also possible take You to Ranu Pane (parking lot at Semeru volcano) whenever visitors need to continue their trip for Semeru volcano climbing or Kumbolo Camping. We serve the private Rental Jeep at Mount Bromo for 24 hours with satisfaction service and picking up service on time. Each Jeep has 6 people capacity and the jeep price counted according to the Jeep amount. So that, Although the visitor amount is 1 - 2 person, the Jeep rental package price is still same. We provide the Hardtop or Jeep rent with various type, color, brand. We supply a Jeep rental package not only to explore the Sunrise from highest peak but also other interested peaks around Bromo volcanoes such as The jeep rent to Seruni Point, Kingkong Peak, Love, Savvana Whispering Sand and other destination in Mt Bromo National Park. Detail information about Bromo Jeep rental price and Jeep rent facility, You can visit Our Contact. Sometime, the Jeep rental cost will be changed into high and lower rate, depending on the season time, and Bromo tour package option You required.